Food outbreaks have become a rising concern over past few decades and continue to negatively impact human health and economic development. Every year the FDA has recalled significant amounts of produce, dairy, and ready to eat (RTE) food from market due to potential contamination from food processing environments. Listeria monocytogenes is one of the responsible food borne pathogens, that cause listeriosis – a rare but severe illness with a mortality rate of 20%-30%[1-2]. One impactful recent incident happened in 2014, in which caramel apple listeriosis outbreak in California, leading to significant economic losses throughout the nation. Most of the food equipment surfaces are made of either 304 or 316 grade stainless steel surfaces. Unfortunately, food processing equipment guidelines only very loosely regulate the surface finish for food and biotech surfaces . Generally, abrasive machining processes, such as grinding, polishing, and brushing uses to prepare these surfaces. Extensive research about the correlation between surface substratum properties and attachment of microorganisms are needed to be studied. 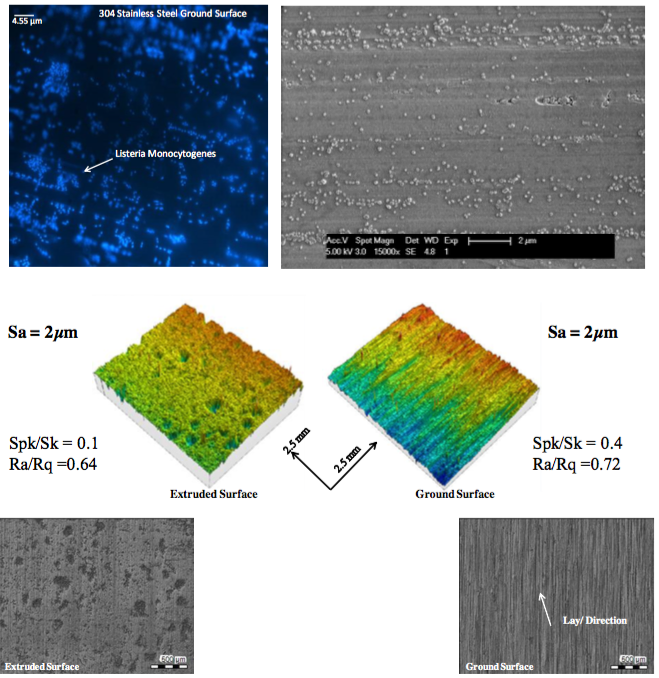 Our research focuses on the detail understanding of surface topographical structures such as: surface roughness, lay/directionality, and processing environmental impact on bacterial retention and biofilm formation on stainless steel surfaces. This study also investigates on how manual grinding operations can control the surface layer properties and aims at finding appropriate roughness parameter(s) that can be used as process monitoring index. Kuda T, Shibata G, Takahashi H, Kimura B; Effect of quantity of food residues on resistance to desiccation of food-related pathogens adhered to stainless steel surface. Food Microbiology, 2015, 46, 234-238. Rocourt, J.; Risk factors for listeriosis. Food Control, 1996, 7, 195-202. Hauser G., Curiel G. J., Bellin H.-W., Cnossen H. J., Hofmann J., Kastelein J., Partington E., Peltier Y., Timperley, A. W.; Hygienic Equipment Design Criteria. European Hygienic Engineering and Design Group (EHEDG), 2004.